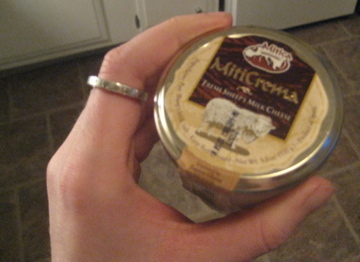 One of my favorite Spanish cheeses is Miticrema- a soft cheese packaged in a pretty little jar. The taste is very similar to cream cheese, but it is a bit saltier and has a grassy undertone, since it’s made with sheep’s milk. In Spain, Miticrema is typically spread on crackers or bread, or mixed with fig spread or membrillo paste – here in the states you could just use a bit of raspberry jam or pepper jelly if you don’t want to get too fancy. Or, you could try the recipe below. 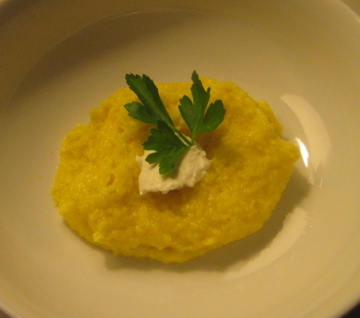 Miticrema makes polenta velvety-creamy, and gives it a subtle, earthy note. The finished polenta is filling enough to eat on its own (perhaps for Meatless Monday), but could be a substitute for potatoes or rice if you want some meat on your plate. Bring chicken broth to a rapid boil, remove from heat and slowly stir in polenta. By stirring slowly and continuously you will avoid lumps. Mixture will thicken in about 1 minute. 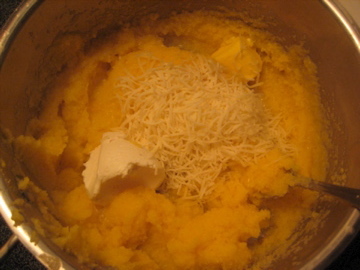 Add entire jar of Miticrema (with a few dollops reserved to top individual servings), cheddar cheese, lemon juice, butter, and cayenne to polenta, stir to combine. Salt to taste, serve immediately. Voila. Where did you find this cheese ? You can find this at specialty stores or many Whole Foods locations. It is a Spanish cheese, so try spanish markets as well!